Confined by budget pressures which forced NASA to pull out of Europe's ambitious ExoMars program, officials will decide by February how and when to kick off a multi-mission project to return Martian soil samples to Earth. The sample return program could begin with a first launch as soon as 2018, but without more money in NASA's Mars budget, the scope of the mission will be limited to surveying the red planet from orbit. NASA could elect to wait until a 2020 launch opportunity, when more money would be available to pay for a rover mission. "There are much fewer options in 2018 than we would have in later years if we were to spread out the program," said John Grunsfeld, head of NASA's science mission directorate. Launch opportunities from Earth to Mars come about every 26 months when the planets are in the right positions. Grunsfeld said Tuesday top NASA officials and the Obama administration would plot a new Mars strategy and roll out the plan during the White House's annual budget request in February. "The highest priority just because of the clock is to pick what are the first few steps, [and] what should we be trying to achieve if we take advantage of the 2018 launch opportunity," Grunsfeld told reporters. According to Grunsfeld, NASA has about $800 million in its projected budget to pay for a Mars mission to launch in 2018. NASA was a partner in Europe's ExoMars program, a two-part mission including a methane-sniffing orbiter launching in 2016 and a large astrobiology-focused rover in 2018. NASA formally retreated from the program in February, when the agency's science budget was realigned to focus on the James Webb Space Telescope, the $8.8 billion successor to the Hubble Space Telescope. The European Space Agency is now finalizing an agreement with Russia to replace NASA's contributions. Chaired by Orlando Figueroa, an aerospace industry consultant and a former NASA manager, the Mars Program Planning Group convened this spring to evaluate a path forward for Mars exploration and formulate plans tying together NASA's disparate science, human spaceflight, and technology development communities. "Capturing samples is how you start a more interdependent collaboration between human exploration and science," Figueroa told a National Research Council committee Tuesday. A Mars sample return mission was identified in 2011 as the science community's next objective for planetary exploration. The Mars planning board agreed the sample return mission is a top priority. 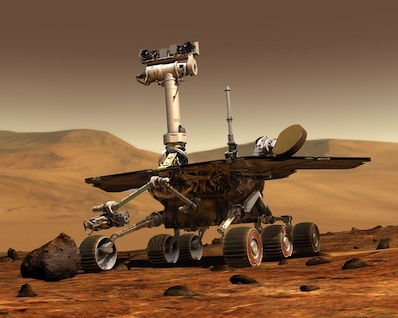 Steve Squyres, a geologist at Cornell University and lead researcher for NASA's Opportunity and Spirit rover missions, chaired the decadal survey which ranked the sample return mission as the holy grail of solar system science. Squyres said Thursday the Mars planning group "clearly came to the same conclusion that the decadal survey did, [that] a sample return is the next logical step in the Mars program." "Sample return represents the best opportunity to find synergies technologically between the [science and human] programs," Grunsfeld said. "That kind of makes sense. Sending a mission to go to Mars and return samples looks a lot like sending a crew to Mars and bringing them back safely." 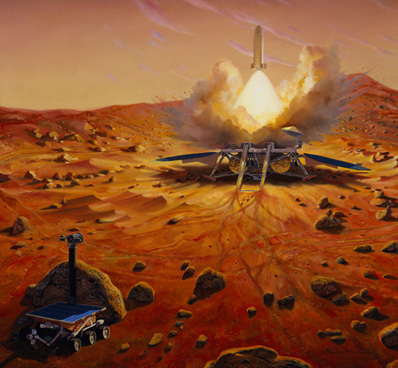 The decadal survey estimated a sample-gathering rover dubbed MAX-C would cost NASA about $2.5 billion, plus some significant international contributions. Figueroa said his team figured a less expensive rover based on NASA's Spirit and Opportunity robots could be developed for between $1.1 billion and $1.4 billion, and still retain the ability to select soil samples for pickup by a later mission. Depending on the ultimate strategy picked by NASA, the agency could develop multiple rovers launched through the 2020s to methodically choose the best samples to return to Earth. Another option is launching a single rover to a site suspected to harbor attractive samples and immediately cache the soil for return to Earth. None of the rovers are affordable given NASA's $800 million budget ceiling for the 2018 launch opportunity, but NASA has more options for orbiters. Spacecraft on the Martian surface relay data back to Earth via probes orbiting the red planet, and although ESA plans to launch a new orbiter in 2016, NASA's existing satellites there are aging and may not be available after 2020. Any rover launched as part of the sample return mission will need an orbiter to efficiently send back science data and imagery. An orbiter will also likely be required to rendezvous with a rocket carrying soil up from the Martian surface and bring the precious samples back to Earth. Human missions to Mars orbit or other deep space destinations could play a role in manually retrieving samples from a robotic carrier spacecraft. "When we can afford to do it, whether its a Mars sample return campaign or a lesser series of missions...that's the forward work we have ahead of us as a community, as a government, and as a NASA team," Grunsfeld said. Regarding Mars sample return, Squyres said: "I think the clear answer is that we should get on with it as soon as the level of funding supports it."